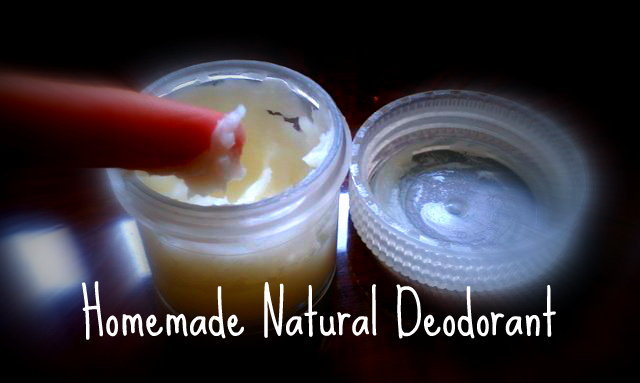 I was speaking with Naomi and Aya on the phone the other night, and my natural deodorant recipe came up. Then we started talking about other natural beauty products and so I promised them I’d write this post on the other items that I use in my regular beauty routine. I think that for a lot of people it’s difficult to make the switch from regular beauty products to non-toxic products–it’s easy to assume that the routine will be harder, or that the natural products won’t work as well. For me the experience has been just the opposite. I have fewer products in my cabinet, my morning and nighttime routine is shorter, and they work better than what I was using before. For me, there are two other aspects about using natural face and body products that I love: 1) just as with my food, I love being able to look at a product’s ingredients and understand exactly what it’s made up of and 2) skin is porous! I like putting things on my skin that I would be comfortable ingesting. 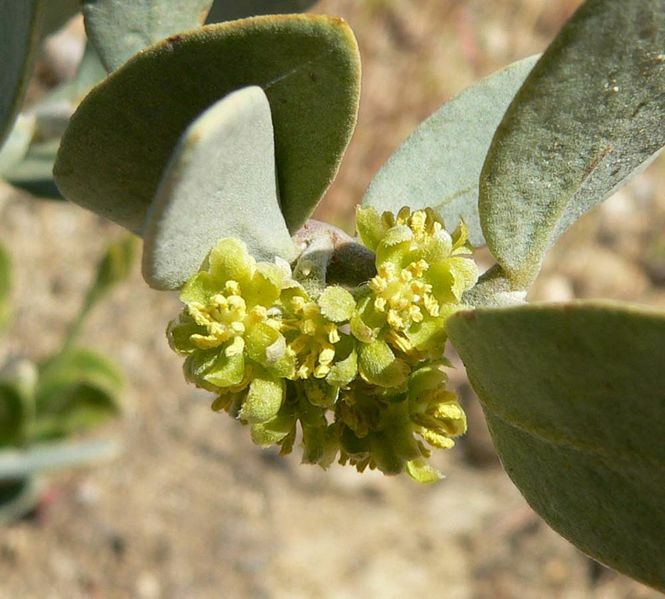 Close-up of male jojoba flowers, by Stan Shebs, Courtesy Wikipedia. As you can see in the image above, I use Desert Essence 100% pure Jojoba oil, but I’m sure that there are plenty of other brands that would be great. The important thing is that it is 100% pure and not cut with any other oils. For complicated scientific reasons that I can neither understand or explain, jojoba is more similar in structure to human sebum than other synthetic moisturizers or vegetable oils, making it an extremely effective moisturizer. As a moisturizer and eye makeup remover: This stuff is expensive, but I only use a drop or two on my fingertips to moisturize my whole face in the morning and the evening. It is also a wonderful eye makeup remover, and doesn’t sting (why do we put things that sting us in our eyes?) at all. As a face cleanser: I only use jojoba sometimes as a facial cleaner (I’m also a fan of Burt’s Bees Orange Essence Facial Cleanser), but I have used it to great effect as one. Simply wet your face, rub a pea-sized amount on your face, and exfoliate with a wet washcloth. The amazing thing about using jojoba as a cleanser or a moisturizer is that you would think that it would leave your skin oily, but it doesn’t at all. Most of us strip our skin of its natural oils daily by using harsh cleansers, making your skin going into repair mode by emitting more oil. Thus begins an awful cycle of dry skin followed by oily skin–I’ve found that using jojoba oil has eliminated this. To combat skin conditions caused by harsh face products: Another benefit of jojoba? I get milia, small white cysts, on my eyelids and around my eyes. I’ve found that by using jojoba oil, almost all of them have gone away. I’ve read in various places that the dyes, fragrance, and mineral oil found in many face products can cause these, and I’m assuming that’s what caused mine in the first place. Coconut oil is a wonderful moisturizer with anti-bacterial properties (which is another reason that it makes a great natural deodorant base). As with Sara’s recent post on using coconut oil for popcorn, many people love using it for cooking. I have started experimenting with it for cooking, but in the meantime, I like using food-grade products on my skin, and unrefined, or virgin, virgin organic coconut oil (you want it to be free of chemical solvents) fits the bill. It is solid when at room temperature, but turns liquid when warmed. Here’s a trick: look for it in the cooking aisle of the grocery and it will most likely be cheaper than the stuff in the beauty aisle–or at least that was the case when I checked at Whole Paycheck. Also, I go through this pretty quickly, but if you keep coconut oil around for a long time without refrigerating it, it can go rancid, just like any oil. It’s easier to use if it’s not solid though, so I keep mine at room temp and haven’t had any problems moving through it fast enough to keep it from spoiling. 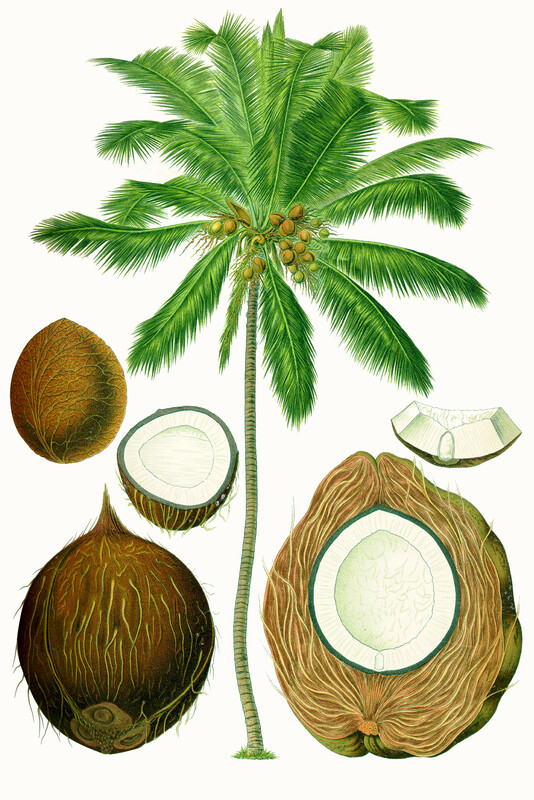 As a body moisturizer: Coconut oil is cheaper than jojoba oil, making it a more cost-effective body moisturizer. In the mornings, after showering, I get a small bit in my hand, rub my hands together to melt it, and oil up. I sometimes add a few drops of grapefruit essential oil for a yummy scent. As a shaving oil: Shaving causes nicks and opens up pores, and adding chemicals to the mix via shaving creams can create nasty razor burn or irritation. You can lather on a bit of coconut oil instead for shaving–you can see your leg easier while shaving and you have the added benefit of moisturizing and shaving at the same time. What the what? The chemical structure of tocopherol, aka, vitamin e.
Vitamin E, or tocopherol, is a fat-soluble antioxidant. Health regulations require that this is listed as tocopherol on ingredient lists, so this is one of those cases where a hard to pronounce item in your beauty products is okay. So many people make claims that are hard to prove about Vitamin E, all of which I’m skeptical about. However, there is some agreement that Vitamin E is good for preventing fine lines and it might be able to help fight sun damage as well. Mainly, though, I wanted a thicker more heavy duty around-the-eyes moisturizer without chemicals and in that sense, Vitamin E fit the bill. 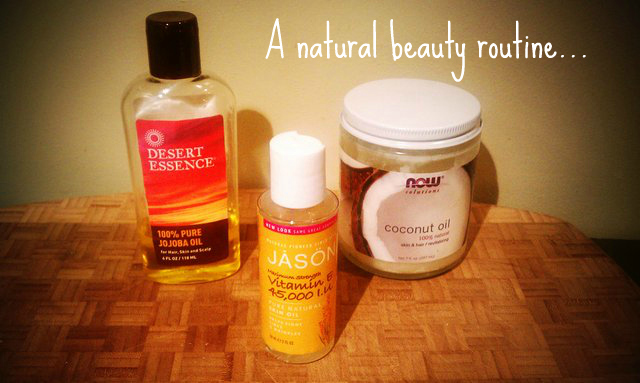 I use a Vitamin E blend from Jason Naturals because that is what I could find easily with good reviews. It is 45,000 IU (International Units), and is Vitamin E blended with Sunflower Seed Oil, Safflower Seed Oil, Camellia Leaf Oil, Macadamia Nut Oil, Pistaschio Nut Oil, Borage Seed Oil, Black Currant Seed Oil, Evening Primrose Oil. Whew! I don’t know what all of those do, but they have a low toxicity rate, which is the important thing. I couldn’t find pure Vitamin E, but that might be better–I’ll have to do some more research. As a wrinkle-fighter around the eye moisturizer: There’s so much conflicting research about what skin products will do what. However, I did want a heavier moisturizer for around my eyes to try and avoid wrinkles and to keep this skin supple as it’s the area on my face that tends to dry out first. The Vitamin E blend above isn’t cheap, but it isn’t as expensive as most of the pricey, chemical-filled eye creams that are marketed to women out there. The product above is very thick and viscous and so I only put it on before bed. As a cuticle treatment: Especially in the winter, I get awful hangnails and dry hands. I massage this into my cuticles before bed or mix a drop of it into my coconut oil for a heavy duty hand lotion, and I find it really does help. When you travel, do you carry a face wash, face lotion, body lotion, and eye makeup remover? I used to! Now, I just fill a little Nalgene travel container with jojoba oil and take that with me (I’m willing to use jojoba as a body moisturizer when I’m traveling to save space). SO much easier than lugging all of those darn liquids through security (I refuse to check luggage). So, in other words, using natural skin care products makes your life easier and your luggage lighter. It’s all about keeping it simple. Another important thing to remember? Just because something is “natural” doesn’t mean its hypoallergenic, so if you have sensitive skin, be sure to test any product in small amounts before taking it on as a part of your daily regimen. Yet another reason to go with the natural stuff? Because I resent all of the magazines, advertisements, and cosmetic companies telling me that my skin is going to hell in a handbag, that if I don’t lather my skin with this, that, and the other that I will have irreparable damage to my skin, and nothing will be able to save the crap show that my face has become as I march on towards the inevitable death of my body. That is all a bunch of BS. And it’s depressing. And the sad thing is that I read it so often everywhere–my need for these products–that it’s easy to believe! Defy them all by just using the simple stuff, not buying their junk, keeping your skin comfortable to you, and not worrying about the rest. Okay, that’s my very long spiel. Sorry for rambling on. More natural home cleaning recipes to follow in the not-so-distant future! I’m on the road currently, and traveling quite a bit over the next few weeks, so I thought I’d do a natural health care “recipe” since I’m not cooking so much at the moment. I came from a family of doctors who took a hands off approach in my own family’s health care–my parents gave us no antibiotics or other meds unless absolutely necessary because of resistance and side effects, and thought that drinking water and resting could fix most things. Needless to say, though I know everyone might not agree with me (and of course many serious health issues necessitate supplements or other drugs), I adopted this hands off approach myself. To this day (knock on wood!) I find conscious, healthy, varied eating along with exercise and other types of stress relief keeps me healthy and gives me the vitamins and nutrients I need. The problem with this approach is that while I was thinking about what was going into my body food-wise, I wasn’t giving a lot of consideration to what I wasn’t keeping out, especially with the products I spread on my body. We’re at the mercy of the stores we shop at and the lenient laws of the US (except for some of us, Aya! ), which allow lots of chemicals to get in our bodies. At the risk of sounding crazy, around the same time the information about plastics led me to try and get rid of some of the plastics in our home, I also starting researching my body products on the incredible website created by the Environmental Working Group (EWG), Skin Deep, and getting really freaked out about it. 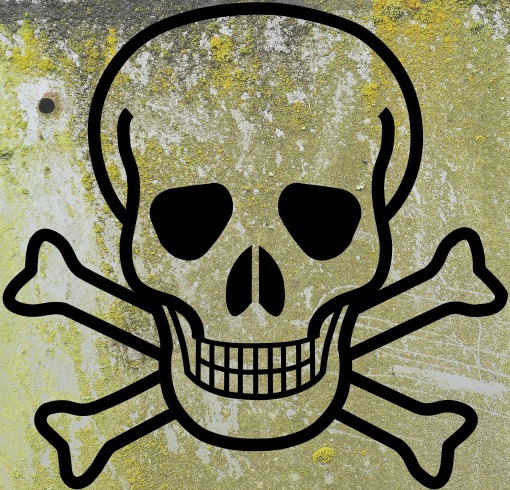 Skin Deep is a database where you can learn (and get terrified) about the toxic ingredients in your cosmetics, soaps, toothpaste, and other toiletries. Sodium Lauryl Sulfate- This chemical may seem innocuous if you look up its properties in Skin Deep–only a 1-2 EWG toxicity rate depending on how its used. It is listed as a skin irritant though. In fact, laboratories throughout the world use it to irritate skin on test animals and humans so that they may then test healing agents to see how effective they are on the irritated skin. So why is it in my toothpaste, shampoo, and skin wash, and why am I spreading this sh*t all over my mucous membranes!?! It’s so hard to find toothpaste without it, but once we made the switch my husband Garriy’s mouth ulcers went away almost immediately, and since switching to shampoo without it, we both have a much less itchy scalp in the winter. 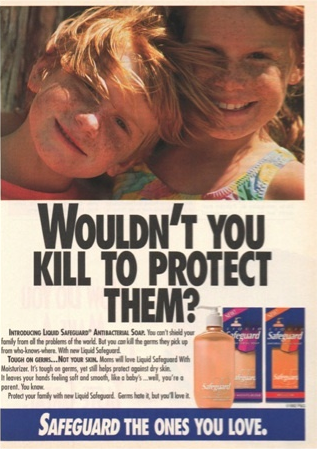 1992 Safeguard Antibacterial Soap Advert: Um, yeah, I guess I would? Triclosan- Our parents just used a bar of soap back in the day to wash their hands and get rid of germs. Today, we’re obsessed with everything antibacterial. Many soaps and toothpastes now contain triclosan, a hormone-disrupting pesticide that according to the EWG, “poses potential toxicity to fetal and childhood development,” concentrates in breast milk, and breaks down into toxic chemicals. Both the American Medical Association and the FDA advise against its use, noting that good ole soap (not the antibacterial kind) and water are equally effective at getting rid of germs. So why the hell is it still in your Dial hand soap, Arm & Hammer “natural” deodorant, and Colgate (it’s banned or restricted in many countries, including the EU)? I don’t know, but it’s a wonderful question. Okay, so I could go on and on, but basically I was upset that I was smearing my body and living with toxic chemicals that I’d brought home myself. After all, shouldn’t we be confident that the substances we rub on our bodies, and which are absorbed through our skin are things that, for the most part, we’d be comfortable ingesting? Coconut oil, by kattebelletje, Creative Commons: BY-NC 2.0. Since I’ve written a book here, I’ll refrain from going through the various chemical reasons why I decided to switch over to a natural deodorant (I’ve not been using anti-perspirant for years), but you can read about possible risks of many deodorant ingredients online. In the meantime, what follows is a simple recipe made from things I always have around the house anyway, and which are food safe: coconut oil, baking soda, and cornstarch. I like to add in grapefruit essential oil because it smells so awesome. I’ve tried lots of regular drugstore and natural deodorants in the past, and I’m a pretty sweaty girl, and none of them ever worked for me. I can promise you that this does the trick amazingly. I’ve seen people put it in old “click-up” deodorant containers or plastic push-up containers, but it seems like a hassle to me, especially since it warmer weather it can be pretty melty because of the coconut oil. We just use a glass jar (a shallow one, not a tall narrow one, so you can get at all of it), or a small Nalgene container when we travel. If it melts and needs to be re-solidified, simply stir and let it sit in the fridge to chill. Note that some people can develop skin irritation or rashes from the baking soda even though it’s not a toxic ingredient, so you can cut back to a ratio of 1 part baking soda to 3 parts cornstarch, instead of the 1:1 ratio below. Mix together the baking soda and cornstarch and add in the 10 drops of essential oil. Whisk or stir all together to distribute the oils. Add coconut oil to powders until they reach the consistency of cake frosting or a bit thicker. Store in a glass container. Apply a tsp. or so with fingertips to each armpit. You may want to make smaller batches or store in the fridge if you don’t use it very quickly as coconut oil, as with any oil, can go rancid if it is left at warm temperatures for months and months.